Investment in 3D printing technology hints at long-distance space travel. 3D printing is a technology on the verge of mainstream popularity. The ability to download free CAD files and then print everything from action figures to guitars is intriguing. Now that the technology is commercially available, a few interesting spinoffs have surfaced. One crazy idea that just might work is printing food. 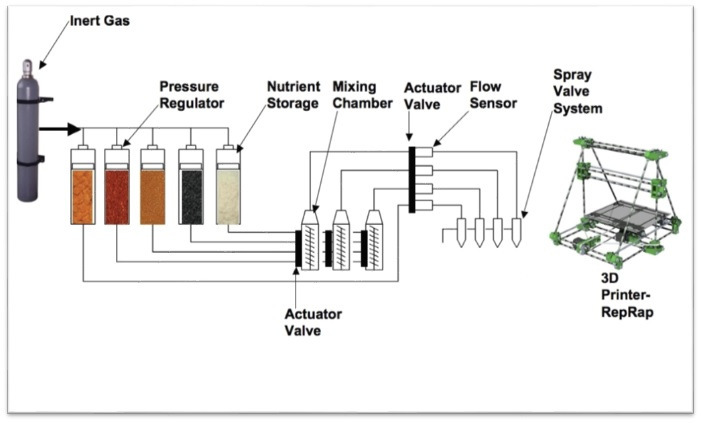 NASA's Advanced Food Technology program is interested in developing methods that will provide food to meet safety, acceptability, variety, and nutritional stability requirements for long exploration missions, while using the least amount of spacecraft resources and crew time. The current food system wouldn't meet the nutritional needs and five-year shelf life required for a mission to Mars or other long duration missions. Because refrigeration and freezing require significant spacecraft resources, current NASA provisions consist solely of individually prepackaged shelf stable foods, processed with technologies that degrade the micronutrients in the foods. Additionally, the current space food is selected before astronauts ever leave the ground and crew members don't have the ability to personalize recipes or really prepare foods themselves. Over long duration missions, a variety of acceptable food is critical to ensure crew members continue to eat adequate amounts of food, and consequently, get the nutrients they need to maintain their health and performance. But [Anjan] Contractor, a mechanical engineer with a background in 3D printing, envisions a much more mundane—and ultimately more important—use for the technology. He sees a day when every kitchen has a 3D printer, and the earth’s 12 billion people feed themselves customized, nutritionally-appropriate meals synthesized one layer at a time, from cartridges of powder and oils they buy at the corner grocery store. Contractor’s vision would mean the end of food waste, because the powder his system will use is shelf-stable for up to 30 years, so that each cartridge, whether it contains sugars, complex carbohydrates, protein or some other basic building block, would be fully exhausted before being returned to the store. Quartz also notes that pizza could be the first food printed in space. A normal pizza is already made in layers of dough, sauce and cheese making production with a 3D printer relatively straighforward. Check out the video below to see a demo of Contractor’s device printing chocolate.